This next-generation IP phone 8800 portfolio, designed for small to very large businesses, delivers advanced, cost-effective, reliable, secure, and scalable high-quality voice over IP (VoIP) communications on all models. (2) Integration of telephony features with personal mobile devices using Cisco Intelligent Proximity technology. (3) Support for in-campus mobile workers who require more rugged and resilient communications due to their rigorous work roles and environments. The breadth of the 8800 Series portfolio, and their sleek and ergonomically friendly design, enhanced user experience, and superb audio performance distinguish these IP phones from any other offerings on the market today. Get affordable entry to HD 720p video, helping you bring teams closer together for faster decision making. Enhance collaboration with advanced VoIP features and crystal-clear audio performance. Increase productivity by importing contacts and call history from personal mobile devices to select 8800 Series phones—even move audio during active calls between these devices. Expand your return on investment with additional line and feature keys available through optional key expansion modules. Stay engaged with your in-campus mobile workers whose roles require hardened VoIP devices that can operate in more rigorous and hazardous environments. 1Contact your authorized Cisco representative for further details on certified providers. Superb audio: Enjoy the best audio performance of any IP phone Cisco has ever produced, with ETSI compliance for echo cancellation and vibration isolation technology for both microphone and speaker. Intuitive, ergonomic design: Rounded keys increase tactile feel and reduce misdials, and widescreen high-resolution backlit displays make for easier viewing and navigation. New software provides menus and notifications that are more visually appealing, and users have their choice of two experience modes for interacting with their phone.2 Contextsensitive soft-label keys and a five-way navigation cluster enhance employee efficiency. Mobile device integration with Cisco Intelligent Proximity: Four of the 8800 Series models support Cisco Intelligent Proximity for Mobile Voice. This feature enables employees to import contacts and call history from their personal mobile devices to select phones over Bluetooth. Users can even move the audio portion of an active voice or video call from their personal mobile device to these phones for better-quality sound when at their desks. And they can keep their personal mobile devices charged, to stay connected when on the go, through a USB port on select 8800 Series models. 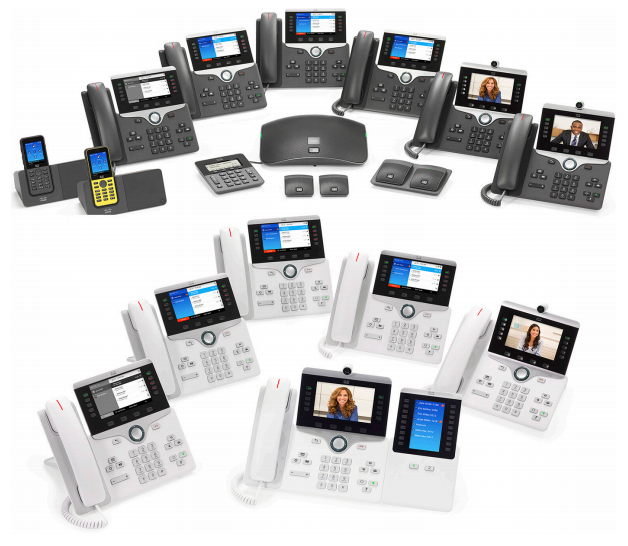 The Cisco IP Phone 8800 Series offers six advanced models of desk phones in your choice of charcoal or white, an audio conferencing endpoint for small to large conference rooms up to 1140 square feet (106 square meters), and two ruggedized 802.11 wireless handsets, in charcoal and yellow, that are designed for in-campus mobile workers who work in more rigorous and/or hazardous settings. The desk endpoints all provide between 5 and 10 lines6 and support both onpremises and remote workers. All of the desk models feature 5-inch (127 mm) widescreen, graphical displays, and most models support color. Gigabit Ethernet is standard on each phone for reduced administration. Select models deliver 720p HD video, USB and Bluetooth for support of third-party compatible headsets, telephony feature integration with personal mobile devices, and support for optional key expansion modules that provide additional programmable lines and feature keys. The 8831 conferencing endpoint combines superior HD audio performance and 360-degree coverage for small to large conference rooms and executive offices up to 1140 square feet (106 square meters) in size and up to 42 participants in a physical conference room. It features full-duplex, two-way wideband audio, a wired control panel for added convenience in multichairperson conference meetings, and options for wired or wireless operation. 2 Session mode and Enhanced Line mode are available on most models. Excludes the 8831 conference phone and 8821 and 8821-EX WLAN handsets. 3 The key expansion modules are supported with Session mode only. 4 The number of key modules and total line or feature keys depends on the phone model. Session Mode Only. 5 Contact your Cisco representative for further details on support and feature capabilities. 6 Number of line and feature key appearances dependent upon whether Session or Enhanced Line mode is chosen by the user. 7International Protection Standard (IP67) rated. 8 ATEX Zone 1/Class 2 and CSA Zone 1/Division II compliant.